The Catholic Bishops’ Conference of India (CBCI) and the National Council of Churches in India (NCCI) jointly organized a Dalit Christian (DC) solidarity Sunday on 11th November. I’m not sure if the event was limited to Delhi, because it was certainly not held in my parish on that day. Nevertheless the occasion has spawned some comments in various fora. 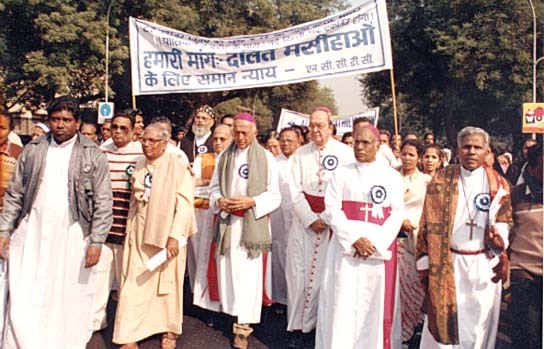 Disparate writers have claimed that 60% – 80% of Christians in India are DCs. One writer has spewed venom at the Catholic Church in particular. He alleges that the CBCI/NCCI policies are dictated by the Vatican and Geneva respectively. He claims that only 9 out of 175 bishops, 12/822 Major Superiors and 1130/25000 priests in India are DCs! I don’t know on what this data is based because I have never come across any specific caste profiling of data collection within the Church. That writer further alleges that there is no reservation of seats for DCs in our own institutions, no policy for their upliftment, and there is no benefit to them from Christian institutions. He questions seeking reservations for DCs, as a form of abdication of one’s own responsibilities for the same. Let us try and address these issues as objectively as possible. To begin with, Christians of Scheduled Caste Origin are commonly referred to as DCs. How many Indian Christians are actually DCs? The first wave of Thomas (not Syrian) Christians were reportedly from the upper castes. The second wave through the Portuguese saw all castes being converted in Goa, and caste identities being strongly retained, till very recently. Even now it is not uncommon to see matrimonials seeking Brahmin Catholic spouses in Goa. In Kerala the Portuguese brought in the fisherfolk, now known as Latin Catholics, again a distinction based on caste. In the colonial British era we saw both Protestant and Catholic missionaries fanning out in the rest of India. The Belgian Jesuits in Chhotanagpur and the Salesians (mostly Italians) in the North East evangelized the tribals, who are not DCs. Protestant missionaries did convert a good number in Punjab. They are still treated as untouchables in West Punjab, now part of Pakistan. Being from the lowest strata of society they are exploited and treated with contempt by the powerful Muslim community, and are often the victims of so-called blasphemy cases. Both Catholic and Protestant missionaries had a major impact in Tamilnadu and Andhra. In Orissa it is probably a mix of tribals and dalits. In the rest of the country, barring pockets in Karnataka, there are no major Christian communities. The major demand for reservations for DCs comes from Tamilnadu and Andhra, and to a lesser extent from Punjab. The 2011 Census of India is very sketchy on religion wise data, so I shall have recourse to the 2001 Census data. At the time there were 24,080,016 Christians in India. The Christian population of the aforesaid three States was – Tamilnadu – 3,785,060, Andhra – 1,181,917 and Punjab – 292,800, totalling 21.8% of the Christian population. Assuming, without admitting, that all these are DCs, and allowing for them in other parts as well, at most one may claim that DCs constitute 25% of the Christians of India. This is a far cry from the 60% – 80% claim loosely bandied about. I may here iterate that the Latin Catholics of Kerala are classified as Other Backward Classes (OBCs), according to the Mandal Report. In 13 States of India DCs are classified as OBCs. Recently in Maharashtra the original inhabitants of Vasai and Salsette areas that now constitute Greater Mumbai, who are euphemistically referred to as East Indians, have been accorded OBC status. If I recall correctly, in Kerala and Tamilnadu, Anglo Indians have also been accorded OBC status. The tribal Christians of the North East and central India are not DCs. So I would reaffirm that the claim of 60% – 80% Christians being DCs is way off the mark. As for reservations for DCs, I feel that the desire of the affected persons should prevail. If they feel the need of it then the rest of the Christian community should support them. Let us not see an Indraesque “foreign hand” from the Vatican or Geneva. There are claims in some quarters that the BJP is against religion based reservations, and we Christians support the Congress because it is in favour of religion based reservations. These claims are absurd. Firstly, Christians do not blindly support the Congress party. Recent events in the North East and Goa prove that Christian politicians are not averse to having truck with the BJP, albeit for their own convenience. Two regional satraps that oppose the Congress – Ajit Jogi in Chhatisgarh and Jagan Reddy in Andhra are Christian. The most high profile Christian parliamentarian, Derek O’brien belongs to the Trinamool Congress. I am not aware of any major political party supporting or opposing religious based reservations, though the BJP Chief Minister of Jharkhand has been demanding that Christian tribals be excluded from the reservation list. What is the ground reality? The Presidential Order of 1950 recognized Hindus only as eligible for SC status. In 1956, when Master Tara Singh went on a hunger strike, Sikhs were also included. In 1990 the V.P. Singh led Janta Dal Govt included neo-Buddhists, later amended to read all Buddhists. The DCs came closest to getting reservations when Singh was the Prime Minister. On 17th August 1990, Prof Saral Chatterji, because of his physical frailty, requested me, as National President (NP) of the All India Catholic Union (AICU), to lead the 130,000 march for DCs to the Boat Club lawns. Our delegation then went to meet the Prime Minister in his office in Parliament House during the lunch recess. When I spoke to him in chaste Hindi that we had waited 40 years he smiled and said that he supported our cause, but the BJP would withdraw support to his Govt if he pushed for it. Thereafter George Fernandes of the Janata Dal and V. Narayanswamy of the Congress (now Chief Minister of Puducherry) did place Private Members’ bills in Parliament, but to no avail. This stalemate led to a public interest litigation in the Supreme Court, which in turn asked the petitioners to prove that untouchability, not just discrimination, existed in the Christian community. This is a Catch 22 situation, being damned either way. I would rather that we worked to remove all forms of discrimination within the community, than try to establish its existence to satisfy the Supreme Court. That too would be no guarantee of success. As NP of the AICU in the 1990’s I had commissioned a survey in Tamilnadu, that seemed the worst affected. It was reported that not only were there separate seats for the DCs in the churches, but even different ciboria for distributing Holy Communion! This was both shocking and disgusting. I had also visited the infamous cemetery in Trichy (TN) that has a wall separating the graves of the DCs from the others. I was told that the sitting Congress Lok Sabha member had declared that he would have his left hand cut off by Christmas if the wall was not demolished before that. Last heard the wall still stands, and the venerable member celebrated Christmas that year with both hands intact. Before me another NP of the AICU had gallantly stated that he wished to be buried along with the DCs in Trichy. He died and hopefully ascended into heaven, but his mortal remains did not descend to Trichy! So the hypocrisy is not limited to the hierarchical church. Nevertheless, glancing at the Catholic Directory of India 2013 (the last so published) I find that the holy Catholic Church has 10,715 parishes and stations, 22,451 priests, 96,617 religious, 14,148 educational institutions, 6,603 social welfare institutions and 2,692 healthcare institutions. If despite this array of human and other resources we cannot uplift our DCs, then even if the Son of Man were to come again, we would not be able to do so. We would also have no right to call ourselves followers of the carpenter of Nazareth who, according to the Mandal Report, would have been classified as an OBC. So the Dalit Christian conundrum remains unresolved. * The writer is a recipient of the Dr Ambedkar Fellowship by the Bharati Dalit Sahitya Akadami. Readers will be interested to note that Prof Brinelle D'souza of the Tata Institute of Social Sciences, Mumbai sent me a copy of the Sachar Report of 2006. Table 1.2 on page 7 sates that there are only 9% Scheduled Castes among the Christian community. This is based on the 61st round of the National Sample Survey Organization. This figure is a far cry from the 25% that I had estimated and the 60% – 80% quoted in church discourse. Wonderful article, brilliant and painstaking research and factual presentation. Caste considerations among Christians is certainly heard but never experienced personally by me. As this practice is confined to a few pockets, it mustn't worry us much. It's incredible that Anglo-Indians are also placed in the OBC category. When uncountable grave problems both spiritual and material don't worry our lordships and excellencies, why should a petty conundrum merit any moving of a finger? Many a time I also feel that we Catholics do deserve the treatment we are getting from the utterly devilish BJP rulers. Not all Catholics share the opinion expressed by you about BJP rulers. I know it because I am a Catholic myself. Caste is deeply entrenched into Indian psyche. Indian Christians, being Indians with roots going back into thousands of years back, is no exception to it. In Kerala it is more pronounced come marriage alliance selection time. A Syro Malabar or Malankara will look beyond to LC or other non-Catholic factions only if they cannot get suitable alliance from own community. With such a mentality that is here to say, it is too much to be asking government to give reservation to DC Christians. It will perpetuate division. I am not quite sure whether our missionaries are being transparent to potential convertee that he or she will drop out of reservation system upon acceptance of Christianity. If they are not letting the simpleton adivasis know this truth up front it is a crime. Next story Get rid of Priestly class to save! Who’ll save Christianity from Church?